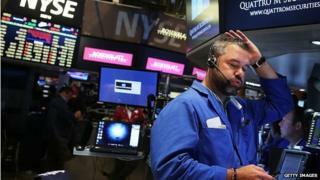 Stock markets across the world have fallen sharply as fears of a Chinese economic slowdown continue to haunt investors. London's FTSE 100 index closed down 4.6% at 5,898.87, with major markets in France and Germany down by 5.5% and 4.96% respectively. In total, £73.75bn was wiped off the FTSE 100 as a result of Monday's falls. In volatile trading, Wall Street's Dow Jones fell 6%, then almost recovered its losses before closing 3.6% lower. At one point it fell below 16,000 for the first time since February 2014, while the technology-heavy Nasdaq index closed 3.8% lower, recovering from an earlier plunge of 8%. The S&P 500 ended trading 3.9% lower and 11% below its May record, putting it officially in "correction" territory - a fall of 10% or more from its peak. Shares in Asia were hit overnight, with the Shanghai Composite in China closing down 8.5%, its worst close since 2007. At its lowest point in the day, the FTSE 100 had lost as much as 6%, wiping some £100bn off its value. Global investors are worried about growth in the world's second largest economy. Media captionStephen Guilfoyle, New York Stock Exchange floor trader: Markets "bordering on edge of panic"
The floor was buzzing long before the US market open. All the traders knew this wouldn't be a typical sleepy August Monday. Minutes after the opening bell, the Dow fell a staggering 1089 points, its biggest ever points drop. One floor trader complained his shirt was soaked with sweat after the early plunge in stocks. Another, Stephen Guilfoyle from Deep Value, told me the US markets were 'bordering on the edge of panic but not quite there yet.' He can remember the crash of 1987 and said this didn't feel as bad. Indeed by late morning, US markets were showing some resilience, leading Mark Otto of J Streicher to conclude that Monday's big market moves in the US were similar to the 'flash crash' of 2010, when billions of dollars were wiped off some of the world's biggest companies in a matter of minutes, only to recover almost as quickly. Robert Peston: Will China’s slowdown make us poorer? China's central bank devalued the country's currency, the yuan, two weeks ago, raising fresh concerns that a slowdown in the country's economy was worse than originally feared. Currencies and commodities are also falling sharply, because those markets rely heavily on strong demand from China. Without strong reassurances from officials in China, investors have not had much reason to buy. Beijing's official mouthpiece has called it China's "Black Monday". The Shanghai Composite tumbled by 8.5%, its biggest fall since 2007. That plunge wiped out this year's gains as investors refused to buy into the Chinese government's repeated attempts to shore up confidence. Everyone wants to know what the Chinese government is going to do next to shore up shares and confidence in the economy. The smart money is on the central bank reducing interest rates and injecting a semblance of consumer confidence into the markets. That is what many had hoped would happen over the weekend. But at each point in what appears to be an ever-deepening Chinese slowdown, the government has seemed slow to react. Selling that started earlier this summer has gained momentum, experts say. "It does appear that we're moving very quickly to the downside," said David Madden, market analyst at IG. Widespread investor fears about the sharp drops in Asia were exacerbated by thin trading volumes in Europe, with many investors away on holiday. "I think more uncertainty lies ahead," Mr Madden said. Investors might have to wait for several weeks for bargain hunters to come into the market to lift stocks. Beijing's latest intervention, to allow its main state pension fund to invest in the stock market, failed to calm traders' fears, both in China and abroad. Over the past week, the Shanghai index fell 12%, adding up to a 30% drop since the middle of June. The sharp fall sparked a global sell-off, with the Dow Jones in the US losing 6%, while the FTSE 100 posted its biggest weekly loss this year, of 5%. Earlier this month, the Chinese central bank devalued the yuan in an attempt to boost exports. European investors worry that a cheaper Chinese currency will make European exports less competitive. The pound fell sharply against the euro, putting it on track for its biggest one-day loss against the single currency in six years, as expectations of a UK rate increase cooled. Greek stocks have fallen sharply, with the benchmark exchange in Athens down more than 10%. South Africa's currency has fallen to an all-time low against the US dollar, dragged lower by worries about slowing growth in the world's second-largest economy. In addition, oil prices have plunged to six-year lows, amid concerns about waning demand for commodities from China. Lower oil prices and worries about China are weighing on the Russian rouble, which is trading at 70.92 against the dollar, its weakest since December 2014. India's benchmark BSE index fell nearly 6% on Monday, the biggest daily fall since January 2009. Will China's slowdown make us poorer? The falling FTSE: How worried should we be?